Your property’s fence needs to fulfil a variety of practical needs from reducing noise levels and assisting with privacy, to keeping its occupants safe by providing home security. It can also assist with a number of aesthetic needs as well including adding to your home’s perceived value, increasing its ‘street appeal’ and enhancing your beautiful views. 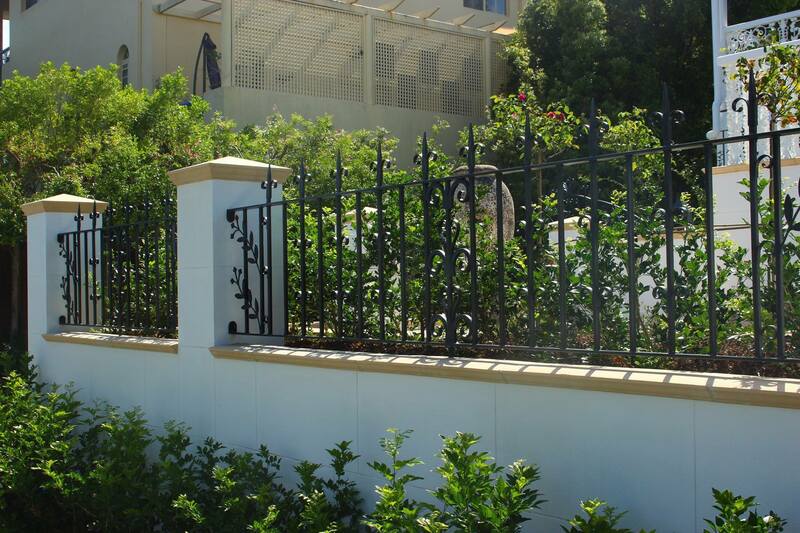 Wrought iron is one of the toughest, most durable fencing materials around, and its malleability also makes it the perfect medium for customisation. Your ability to showcase your home’s unique personality is only as limited as your imagination! Here are some of the benefits of choosing wrought iron fencing for your home. There is a reason that wrought iron is known as ‘100-year fencing’ and that’s because it is extremely durable. In fact, it is wrought iron’s low carbon content that greatly increases its durability beyond normal iron, and allows wrought iron fencing to stand strong for an extremely long period of time. Wrought iron can also withstand a great deal of physical trauma and weather exposure without becoming damaged, bent out of shape or in need of repair or replacement. And forget the rot and the rust that can plague timber and aluminium fences – the strong core and protective coatings of wrought iron fencing will guarantee you a fence that will last a lifetime. Which ultimately saves you money in the long run! Unlike other fencing materials, wrought iron is less susceptible to physical damage, so therefore it requires fewer repairs. And while it’s difficult to actually damage a wrought iron fence, if it does suffer a bit of wear and tear or a section becomes damaged, it’s unlikely that you’ll have to replace the entire fence as small portions are usually easily repaired and/or replaced. Maintenance is also extremely low as most wrought iron fencing these days comes treated, so some will only require a regular wipe or hose down in order to keep them looking their best. If they do require a touch up, the only maintenance really required to keep it in tip-top condition is a new coat of rust-resistant paint every year or so. Of course, the exact timing between paint jobs does depend on the weather conditions your fencing is subjected to, however wrought iron fencing in milder climates will literally need no upkeep at all in order to keep it in great condition. And if you do notice rust spots developing? A simple sanding and paint job should do the trick – which can be accomplished in no time at all! One of the other advantages of wrought iron is the level of security that it offers. Wrought iron fences that are secured in the ground are unlikely to be broken, cut through or torn down. They can also withstand physical pressure without falling over, so are ideal for keeping animals and large pests out of your garden. If your fence includes additional elements like decorative spears or spikes (the industry term is ‘speared finial’ by the way), then you can also guarantee you’ll be discouraging intruders from climbing over your fence into your property too! Wrought iron fences can also keep valuable items (including children and pets) inside your yard, particularly if you choose a style that prohibits them from jumping or climbing over your fence, or slipping in between too-widely-spaced bars. This also makes them perfect for swimming pool enclosures too, because you’ll not only have your loved ones in sight, you’ll retain the beautiful views through your fencing as well. One of the wonderfully visual benefits of wrought iron is the timeless and classic aesthetic beauty that other fencing materials just can’t replicate. Wrought iron fencing can be designed to match your home’s overall colour scheme, and it can be easily worked and shaped into interesting patterns and shapes due to the nature and malleability of the metal. Working with wrought iron is an artisanal process and much of it is hand worked (‘wrought’) with special tools to produce a distinctive decorative appearance. Hence, wrought iron fences can be styled to complement a range of home designs, from traditional and formal to modern and casual. Given their durability, they also won’t show wear and tear as easily as other fencing construction materials, so they’ll stay looking beautiful for years to come. And of course, the nature of their ‘open’ construction means that owners can embrace the benefits of their property’s views – whether it’s accenting the beauty of a rose garden or capturing a spectacular sunset over their wrought iron fence’s boundaries. When it comes to selling a property, there is something called ‘perceived value’ which is not the actual valuation, but how much your home appears to be worth. While you do want to increase your property’s actual value, improving its perceived value is also important, and installing wrought iron fencing is a great way to do this. Wrought iron fences can improve your home’s exterior appearance, and their aesthetic value can also increase its ‘street appeal’ and act as a focal point for your entire property. Intricate curves, spirals and classic columns can also incite a feeling of luxury, and boost your home’s value as a great investment. Secure and imposing wrought iron fencing can also act as a visual deterrent, conveying a sense of safety that will be a big asset to the worth of your home, which may lead to a more attractive offer if you are looking to sell. Opting to design your own bespoke wrought iron fencing not only adds a personalised touch to your home’s design, the malleability of wrought iron makes it the perfect medium for you to customise your own designs, and allow you to truly capture your home’s unique personality. Complex curves, spirals, scrolls, decorative insets and intricate designs or patterns can add a point of interest and increase your property’s appeal. Coupled with other building materials including timber, glass, steel and brickwork, you’ll obtain a unique result that’s almost impossible to replicate with other fencing materials. Let us introduce you to some of the many benefits of wrought iron fencing. Contact the experts at Dean-Wilson Iron on 3814 0076. Previous Post Backyard Fencing For Dogs – What’s My Best Option?Next Post What Are The Main Components Of A Wrought Iron Fence?